We have had fabulously springy days here lately. 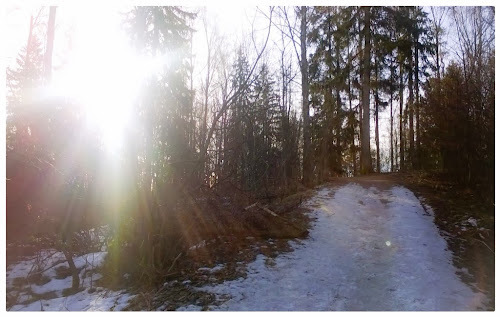 Sun has been out, and I have been walking through this patch of forest behind our house every morning with the dog, the rising sun shinig through the still barren trees. Actually, by the time we are out walking, at around 9am, the sun is already quite high this time of the year, but not over the tree tops yet. Squirrels are scurrying about, birds are chirping in the trees. Very spring indeed! 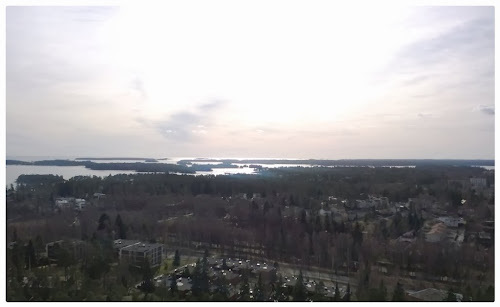 Yesterday I went for lunch at this restaurant on the top of a water tower in Espoo. It was horridly windy, but the sun was shining through a pale orange haze created by the ice melting from the sea, and the sun warming the open spots of the sea, creating water vapor, that then lingered in the horizon.